I’ve always wanted to like 100%-grass-fed beef, but it always made me a little sad. With the first bite, there’s promise but I always find it ultimately lacking the flavor and succulence of beef finished on grain. Having bought in wholly to Michael Pollan’s argument in favor of the natural elegance of beef grown on green grass and clover, being devoted to people who farm for a living the best way they can and wanting to support them, and simply liking eating food raised near my home, I so wanted beef that wasn’t grown wading in CAFO waste, slaughtered en masse, and packaged in plastic and Styrofoam before it reached the grocers, that I held out hope. But ultimately I couldn’t justify paying so much more for it. I’d all but given up when I ordered a strip steak from Aaron Miller’s farm, at Karen Small’s Flying Fig on Cleveland’s near west side﻿. I’d eaten this Ohio farmer’s beef—as a tartare, as a burger—at a couple restaurants but I’d never had a cut from the loin,the litmus test. My fork dropped with a clank to the plate. This was it. I asked our server to bring out the sous chef to confirm this was, in fact, from Aaron Miller. Because I didn’t believe it. When Doug Katz, chef owner of Fire Food & Drink, another beloved Cleveland restaurant, called to say a lunch was being planned at Miller’s farm for a local TV show and would I like to come out, I immediately said yes and Donna and I drove due east on Mayfield near out to the Pennsylvania border just south of Pymatuning lake. I wanted to know how his steak was so different from every other grass-fed steak I’d eaten. While it’s infinitely nuanced, the basics are few. “It starts in the ground,” he said. He covers his starting field and his finishing field with a mixture of micronutrients that include zinc, copper and boron. This results in protein rich grasses and nutrient-dense, nitrogen-rich clover. The grass is precious to him. Local hunters who take their trucks past his fences rolling over this grass infuriate him. He knows when to set the cows out on each paddock of fresh grass and how long they can eat it. If the grass is too old, it will have lost its nutrition, if they eat too much of it, it won’t grow back well. The grass he grows to feed the cows all winter as hay must be cut before Memorial Day or it will be deficient. “If you’re at the Memorial Day parade and you don’t have your hay, you’ll be behind the eight-ball,” he says. And the final part of the equation is minimizing stress. He buys 10 or 12 calves every couple months and puts them on a grass-rich, organic pasture to help relieve the stress of being separated from the cows. They’re then strip grazed for a year or so, moved every day or every other day to a new strip of his 60 acres. They’re then finished on a separate 30 acres a mile down the road. This acreage is heavily enriched with the micronutrients. The grass is deep green and grows in thick tufts, the clover huge and dense. Each Wednesday he takes 2 or 3 cows to slaughter, done nearby by a friend. The carcasses are hanging 50 minutes after they leave their field. Every animal is different, like you and me, he continued, some tall and slender, some short and stout. You can’t go by a weight or an age. Aaron, age 52, who owned an auto parts store out here where he’s lived his whole life, has always farmed and for years raised dairy cows on the side. Eleven years after giving up his auto parts store to raise cattle full time, he’s learned when a grass-fed cow is ready. “There’s Doug’s cow,” he said, pointing to a Hereford-Angus blend he’d picked out for chef Katz’s next delivery. “See that brisket, how full it is. Now look at that Angus next to her, see how flappy it is. Not enough fat.” They also develop two big rounds of fat on either side of the tail, he explains. And you shouldn’t see any trace of ribs. For more about Aaron and his farm, visit his site, millersgrassfed.com. Biggest mistake most grass-fed-beef farmers make, he said, is not letting their cattle get fat enough. It’s all about the fat. And this grass-grown fat is some of the best there is. And here’s a video of the Miller farm, cows, chickens, lambs and pigs, all pasture-raised. These are happy animals. Free Range Farming from Blue Green on Vimeo. Wow. I never knew how much science went into the beef. I am yearning for some grass fed beef up here in Quebec. If I can find a farmer that takes as much care of the cattle as Mr. Miller, I wouldn’t care HOW much I would have to pay. I have a freezer and a sous vide machine that would keep me in business for the whole winter. Does anyone know about where to look in Canada for something like this? …Does anyone know about where to look in Canada for something like this? The only answer I have is “Alberta”. I had nothing but grass fed beef growing up, and because of that, I don’t really like grain finished beef, especially corn fed beef. It tastes like margarine to me. Didn’t realize I had such a place so close to me. The family went to Pymatuning every year camping and it is less then 2 hours from my western PA abode. Thanks for sharing this Michael! My understanding is that the USDA makes it hard for small farmers to slaughter beef for their local market; unlike goats and chickens you have to actually go to a slaughterhouse with a UDSA inspector. This favors the CAFOs who have big enough operations to support a full-time inspector. So, for example, in San Diego, local grass-fed beef cattle have to be transported to LA, the nearest inspection point, for slaughter. At that point, they might as well sell their beef in LA rather than spend the money, gas and time to transport it back to San Diego – so we can’t get true local pastured beef here (though there is a growing market for goats and chickens). I wonder how Aaron Miller’s friend’s slaughterhouse operation works? And I’m not sure if the same rules apply to pork? you’re absolutely right about the slaughtering rules. that’s the biggest impediment. Mobile processing just might work. It’s new but may be what many ranchers are looking for. http://www.homegrownmeats.com is in La Jolla and their grass finished beef is from their partners ranch in the mountains east of San Diego. I’m still with Thomas Keller on the whole grass-fed thing. It may be noble work but I still prefer beef that’s finished on grain. I was too, until I tried aaron’s beef. Nice write up. I’ve been buying my meats from Aaron and Melissa for a few years, they are great people and now good friends. Good food brings people together. That is a very interesting article. I have been buying my beef, lamb and pork from local farmers for a long time. Maybe this is a little easier here in Colorado but I am sure not any cheaper. I have to ask about the cows exact grass feed next time. This sounds like my kind of beef and beef producer! It takes a lot of talent to raise cattle to market weight AND produce fabulous tasting meat. It sounds as if Mr. Miller’s attention to detail are paying off. Good for him (and his slaughterhouse and butcher). I’ll have to keep an eye open at the West Side Market. Do you know if any other local growers sell there? I’ve never seen any of them advertising local beef. aaron will be selling more frequently at west side market. doug katz also offers it retail. Miller’s beef is available occasionally at Foster’s at the Westside Market. They tried local pork also but I think that it was a hard sell. When Aaron comes in himself and hands out samples it really helps. Views on venison next? Tis the season. Mark, there are several producers in western PA. I live in Pittsburgh, and my family has been purchasing beef, chicken, pork, and eggs from Joe Rush (http://rushacresfarm.com). He delivers to the city on a regular basis, and much like Aaron Miller, takes great pride in his grass farming. And, of course, the food he produces is amazing. Excellent post, MR. I’ve recently taken to cozy confines with a local Orme beef producer. So much to learn from her, and every week at the Sedona Farmers Market I make sure to buy something new. While I’m there I ask here a ton of questions, share my cooking experiences from the previous week’s purchase, and generally learn more about what grass fed really means. The relationship has developed to the point that I’ve been invited out to the ranch to participate in round up. Just hope I’ll be able to after knee surgery next week. If not, I’ll go anyway and man the chuck wagon! The real point here is that there is grass, and then there’s GRASS. And not many beef producers seem to realize that, or to care. Of course, depending on where your farm is, you may not have the luxury of treating your livestock to the smorgasbord that the Millers have set before their beef cattle. Which also brings up the question of…which breed does best on grass? I’ve seen a lot of growers experiment with “exotic” breeds (or so they were considered back then) such as Santa Gertrudas, Chianninas, Aquitainians, Scotch Highlanders (they should all be sent back to Scotland), and even Shorthorns (once the most popular beef breed). It all depended on the quality of the grass and hay. And I’m sad to say that these “experiments” all came to naught when no one seemed willing to pay the price that they were asking (we’re talking rural New England here). Also, although I’m no great fan of the USDA, The last thing I want to see is uninspected meat being sold on the open market. It’s one thing if you know where it comes from, and you’re OK with it. But in no way do I want to buy meat that hasn’t, in some part of its passage to market, passed under the scrutiny of a qualified USDA inspector. I’ve seen too much to feel otherwise. Thanks for this extra information (the photos are really helpful!). 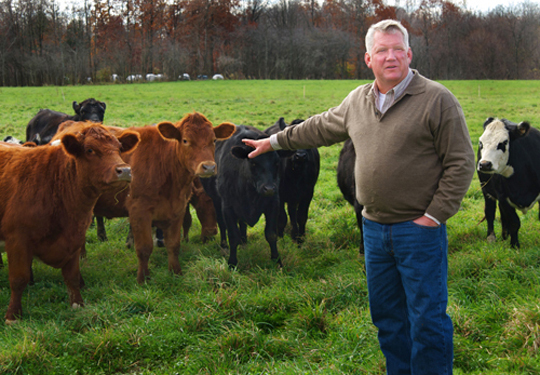 We have a grass fed farmer that we love in Johnstown, OH. I’ll have to take a good look at the cows’ “briskets” next time we’re there. Bea, I raise animals for mea and eggst. I pasture them, and care for them very well. When they’re old enough to eat or their egg production drops way down, I slaughter them. Feel free to observe a vegetarian or vegan lifestyle if you like, but I choose not to. Deal with it. I’m grateful for your comment, bea, and had a look at your site. These are issues people who eat meat are responsible for understanding. I believe that we do animals a service by giving them good lives and humane deaths. I like you deplore the horrific conditions and deaths that so many animals suffer at the hands of industrial farming and don’t do enough to speak out against it. Bea, we raise grass fed beef in humane conditions and are very proud of what we do. What you need to understand is that if farmers didn’t intend to slaughter their animals for food, these animals wouldn’t even be alive in the first place. Farmers aren’t going to maintain bucolic pastures of grazing animals just because they’re nice to look at. Also, if you think your eating habits don’t result in the death of animals, you need to know that thousands of small animals are brutally killed by combines on large farms when produce is harvested. And if you’re eating corn and soy products, which most vegetarians-especially vegans-are, you’re directly supporting Monsanto, a corporation that has been extremely detrimental to small farmers and which has fostered environmentally unsafe farming practices with its Round-up resistant seeds. In third world countries, where Monsanto is rapidly spreading these seeds, these practices are literally making people sick. Thank you knoxbeef for that comment, two powerful points, most importantly that if we didn’t eat the animals they wouldn’t exist at all. I know a lamb farmer who is convinced his lambs know this and are good with the arrangement. interesting, and thanks to the grassfednetwork link. aaron raises angus and herefords and mixes of the two. but he says he can make any steak taste the way it does through the raising and feeding. more about that than genetics, he believes. This point is an excellent one for anyone interested in producing a quality grassfed/finished product. This article goes into depth about forages and soil health, two very important areas I agree, but I also believe that a smaller framed animal with English genetics will help greatly as well. We began using Devon cattle at our farm 5 years ago and love them for their docile temperment ( a must for grass finishing), marbling (every animal we finshed in 2010 graded low choice or better) and tenderness. Been buying grass fed beef from David at Baron’s Meats for a couple of years. Great taste. Caveat, it cooks faster than grain fed. Pay attention. I thought it was because grass fed typically had a lower percentage of fat then grain fed beef. You should experiment with an extremely lean piece of beef and a high fat piece to see the difference. Good things to know, for when I get my farm up and running. You’ve got to try Bryan Flannery’s grass-fed Wagyu from Oregon. Absolutely fabulous stuff (and this from a guy who just can’t stomach grass-fed beef). Having recently taken a road trip from LA to Napa, via Rt 5 that passes some of the nations largest cattle mass production farms over hundreds of acres with not a green speck in sight, I can truly appreciate this article. And, after eating the meat at ‘Fire” can attest to its good taste also. Knowing the care in raising them and how they’re sustained does make a difference to them and us. If you are ever out in the Bay Area, I highly recommend you take a tour of Marin Sun Farms (http://www.marinsunfarms.com/). They seriously care about their grass! Nate, who is responsible for livestock operations, gave us our tour. Fascinating view on how you can really farm the sun. On their farms, cows, grass and other animals (namely chickens) all work in natural harmony with each other. And produce delicious meat as well. I’ve been hooked on their beef (and chicken/eggs) for a few years now. Every piece I’ve had is fantastic from ribeye steaks to ground beef for burgers. My grandmother always named her calves “Veal Chop” so that she’d always remember their purpose in her life. Is it a misprint as to the holiday the hay should be put up by? Not sure how he’s getting the hay to dry that early in the year if it is Memorial Day. that’s also likely first cutting hay – which depends on where one lives. First cutting hay in CA for instance would be different from Eastern OH – depends on grass development – hay dries in direct proportion to when it is cut, and weather conditions. I tried grass-fed beef from Wild Harvest a few years back and found it dry and gamy. However, the beef I get from my local farmer, who feeds Black Angus on some gorgeous green fields here, is so rich I can’t even eat as much as I’d like, and I fed 15 friends on 1/3 lb burgers–one apiece, and the ones who wanted more couldn’t finish them. Delicious. Jason: Just outside Montreal in the Eastern Townships there’s http://www.fermeborealis.com/ and there is also http://www.fermemorgan.com/ north of Montreal who have butchers in Montreal that use their meat. Do you have a restaurant, if so where is it so I can come sample your wares. Does anyone know a source for this kind of beef in the Seattle-Tacoma area? You might try asking the folks at “Bill the Butcher” in Seattle, Woodinville, or Redmond. The “Swinery” in West Seattle might also help. Or, “Rain Shadow Meats” up on Capitol Hill. Thanks very much! We’ve been to Bill the Butcher once or twice, and its fantastic! Vegetarian for over 20 years! Re-introduced to MEAT as a result of TCM (traditional Chinese Medicine). Would not eat meat or eggs from anyone other than the Miller Farm. More humane than factory farms… GO LOCAL-GO COMPASSION. I am all kinds of enthusiastic over the Millers and their wonderful beef program. I sincerely wish there were thousands of Miller-like farms around the country. I would love nothing more than to see these farms prospering, along with local meat processing operations. Unfortunately, we Americans have gotten used to the idea of cheap, plentiful meat. I confess to being as guilty as anyone reading this. How many times do we wander into the supermarket meat section, looking for what looks good, what’s the best deal? I do this every week, sometimes more often. There was a time when I had a freezer full of a whole or half a cow or pig. I had to plan what I would be de-frosting, cooking, etc. In my semi-retirement, I have fallen into the “That looks good; I’ll have that tonight” syndrome. And never mind that most people would have no idea what to do with half the cuts from a whole side of beef. When I was in the business it was steaks, a few roasts, and the rest into hamburger. Here”s a “for what it’s worth” thought….The two most memorable steaks I ever ate : one was in Uraguay; the other was in Sweden.The taste of both was similar! The best chicken I ever had was also in Uraguay. Go figure. I hear so many people whining and complaining about how expensive food is that’s fresh, organic, grass-fed, etc. Sometimes yes, it is more expensive. And sometimes its not. However, it is very short-sighted and close-minded to only look at the few extra pennies you’re pulling out of your wallet. We have to also think about the cost to your health, the cost to the environment, and the cost to the well-being of the animals involved. I’m more than willing to pay a few extra pennies (or even dollars) to ensure that I’m not ingesting a bunch of chemicals and hormones that my body can’t properly digest and which causes all kinds of detriments to my health. I’m happy to pay extra to know that the food I’m eating is fresh and sustainable instead of polluting and destroying our planet. And I’m glad to pay more money to have the peace of mind that comes from knowing that any animals that are contributing to my dinner plate were grass-fed as God intended and that they were happy and humanely treated in life and in death. From the beginning of time our connection to food has been a symbiotic intimate one; organic, engaging,challenging, and based on survival. As our food needs and choices progressed over time and evolved based on life sustaining cycles of economy in supply and demand, I believe the components within the food have influenced our taste buds and eating desires, which is why some ‘better’ foods, like grass fed meat, may seem to lack flavor. We’ve become addicts to the additives and byproducts infusing the food that has insidious effects on our health. As society grew, our food culture became distracted, less pure, forwarding on to a fast food nation. I’m glad for the shift back to being more conscious about food sources and having healthier choices. It may take more effort and money, but worth it to survive the next phase of our planet. Once I made the decision to eat food that didn’t have hormones or other chemicals in it I easily justified the cost of pasture raised meat. What it means is that I eat less meat. This has made me a better cook and a healthier eater. Win win. PS I love the beef from Prather Ranch that I get at the Farmers market here in San Francisco. It tastes like it has butter on it. Delish. A while back a group of us got together for a Sous Vide potluck. I did 72hour shortribs and had grass fed ribs ( from wholefoods, so probably not even the really good stuff ) along with a couple of different standard fed ribs. The grassfed was unanimously voted the best after a blind taste test. Although I once bought some Australian Grass Fed Beef from a local supermarket here in Austin …. Kind of destroys the point of going for good healthy well raised meats if you have to fly it up from the arse end of the world, although still not quite as ironic as watching hippie vegetarian types buying out of season organic vegetables and driving home in their Prius. Miller has it all figured out. This is a great post. I have pretty much always thought that grass fed (and finished) beef is far superior, but as a resident of northern VA I’m afforded the luxury of being able to get all of my beef from the one and only Polyface Farms. One other thing… I do know that the length of the grass is so important for cattle. 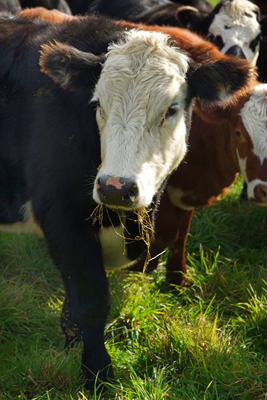 Unlike horses, which crop the grass short with their teeth, cattle must wrap their tongues around the grass in order to eat it. So if the grass is too short, the cattle will not thrive. 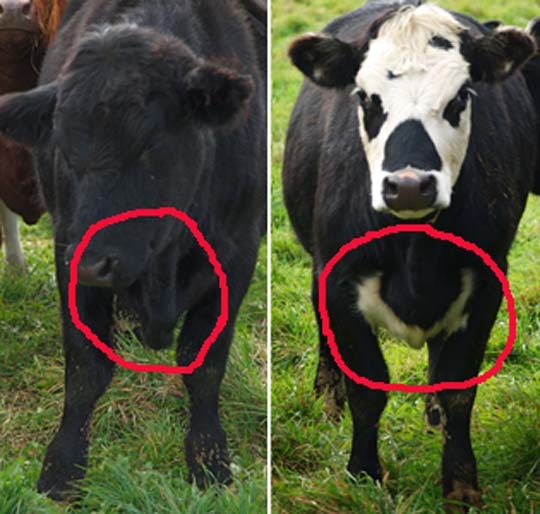 That’s why Miller moves the stock every day… Longer grass equals fatter cattle! I have begun the search for grass-fed beef in the state of Michigan. My wife and I vacationed in Maui, Hawaii this past October, and ate grass fed beef burgers from a local brew pub. It made sense to me that a small island would produce it’s own beef, since importing from the mainland is so expensive. It was also very tasty. That experience made me wonder if grass-fed beef was locally available where I live, in eastern mid-Michigan. I discovered there is local grass-fed beef available, however only by the whole or half cow. Which is cost prohibitive for the “average Joe”. Besides, can a household of two people (my wife and I) consume an entire half a cow in a year? I’m hoping that I can find a local butcher that carries this local grass-fed beef, so that it can be purchased by the piece. It would be great if more people demanded this type of quality beef in their local supermarket. If we could create the demand, maybe our supermarkets would respond and make it available. I’m even willing to pay the higher cost per pound, it just has to be available somewhere. Great article. Maybe I’ll have to pay a visit to Ohio and check out some of the restaurants you mentioned. Those eating grass fed beef should be happy to know that the omega 3-6 ratios in the fat of grass fed beef are very healthy and approach that of salmon. Grain fed beef is a very different story for heart health however, since those ratios get reversed from what is essentially a diet alien to cows. Additionally, seems like finishing is the most crucial part, so ‘grass fed but grain finished’ beef is going to have similar omega ratios on the dinner plate to beef that had been 100% grain fed. It’s all about the fat indeed. I personally love good grass fed beef and could sympathize with the commenter who mentioned that grain fed beef reminded them of margarine. I’m not sure if it’s a mental block for me or not, given the health issues for both myself and the animal, but I would have to agree with that commenter. I buy from a local farmer who has grass fed beef and that beef is so beautiful, flavorful and cherry red. It’s good to hear about farmers taking such pride in their animals and work and I’m sure that meat is outstanding. Hopefully these will be the kind of farmers that our nation chooses to give more subsidies to in the future because this is the type of food people need to be eating. Noooo! I buy from Aaron and every time one of these articles gets published it gets harder and harder to get all the cuts I want! Please stop paying attention to the best farmer in the midwest! In all seriousness, you have not eaten a steak until you have eaten a Miller steak. So now that I’ve bought my side of grass-fed beef, any recommendations for what to do with it? Are there good cookbooks or blogs with recipes for some of the stranger cuts you end up with?